Now capable of supporting a printer! Cassette (inside dims): 7" x 11" x 1.5"
External dims: 16.25" x 19" x 6"
The StatIM 2000 Can Now Support a Printer?! Yep! It has always been that only the StatIM 5000 could support a printer. 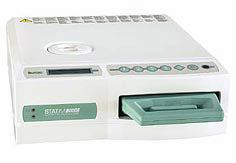 The new StatIM 2000 Cassette Sterilizers can now print cycle data as well, through an external printer. All it requires is a software upgrade and printer port kit and an external "receipt" printer (see below for compatible printer options). On all new StatIM 2000 purchases, Fisher Biomedical will even provide the printer software upgrade and printer port kit for FREE if requested. You simply need to pick up the printer online (some links below) for between $175 and $200 and plug it in.